About several hours ago I started getting A LOT of spam e-mails, 6 per minute on average. I have no idea what went wrong. This is the e-mail address that I'm using for years and I was very careful in regard where I was typing it. I know a lot about computers, software and stuff (started working as a programmer recently), and I'm saying this just to throw out recklessness from the equation. It's my main e-mail, not gmail or yahoo or some other, it's the e-mail that has been given to me from my internet provider ages ago, and it has been used for serious correspondence only. Almost all e-mails are the same, I'll take a picture of one and post it to you guys (my e-mail address is crossed out on every place it had been stated). And it's stated there that I've been actually sending some meaningless e-mails from my address to random people and that they were undeliverable. I have no experience in this and have no idea how this has happened. Can this somehow be fixed, or can anyone at least explain to me what is going on? The messages you show mean that somebody is using your email address as a sender. This might mean that your mail account is compromised but it can also be that the attacker got information about your email by compromising users which received mails from you or by simply guessing or generating random email addresses. Email is similar insecure as snail mail, i.e. one can write anything as the claimed sender at the envelope and this means that the claimed sender gets a bounce message if the mail could not be delivered. Once spammers are using your address as a claimed sender as in this case there is not a lot you can do. If you have no control over the domain you probably can only delete all the bounces from your inbox. If you have control you could configure SPF and DKIM to limit how much your address can be used for spoofing. 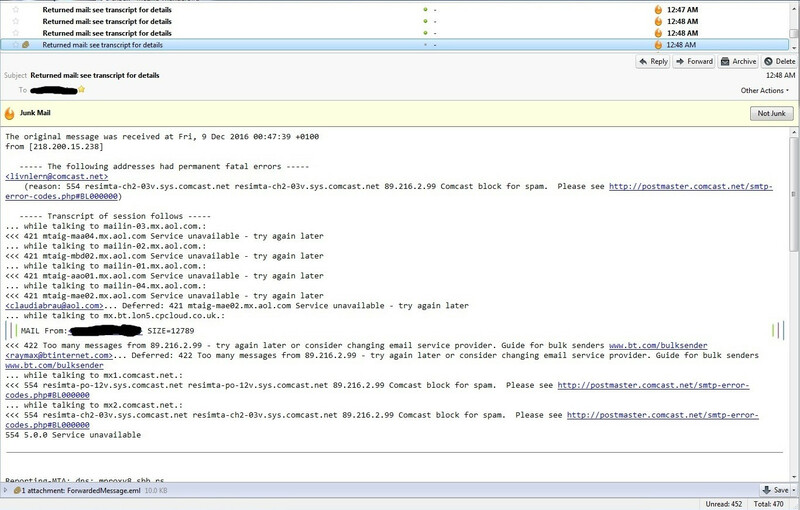 For more details see Why is it even possible to forge sender header in e-mail? Looks to me like your computer has gained some malware turning in into a spam bot, and you are receiving the bounce messages when your spam bot is blocked. Malicious users trying to create yahoo accounts with random emails at my domain? A “new domain registration” spam? I received a spam, how can I understand it in order to report it?